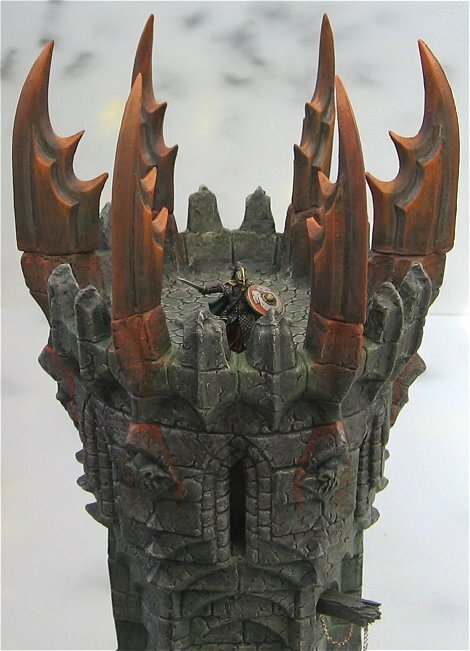 Here’s a few pictures of a tower that I’ve painted for use in my Lord of the Rings games. It will eventually also be able to be placed inside some castle walls and will be used as a border fortress for my evil armies. The tower is from Monolith Icon in Poland. It stands at just over 50cm’s. 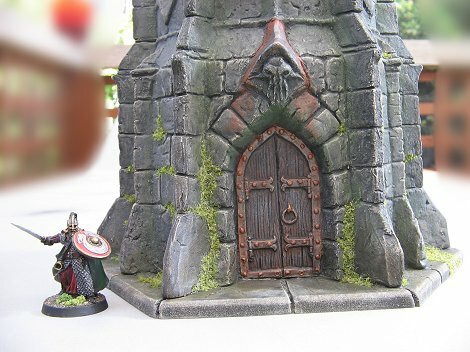 They make some amazing terrain pieces and I will definitely buy from them again. I made the base of the tower out of MDF and the wooden beams are balsa wood. I sprayed the tower black. Next I drybrushed the whole thing with a medium grey acrylic paint. This was followed with a very ligh drybrush of white acrylic. 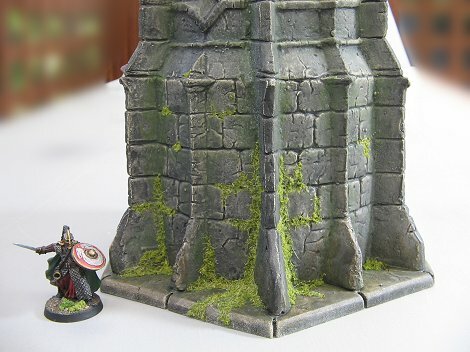 The whole tower was washed using Woodland Scenics Stone Gray pigment. All the metallic features were painted using Games Workshop Boltgun Metal. All the wooden features were painted using GW Scorched Brown, Bestial Brown, Codex Grey and Bleached Bone. Next, the whole tower was washed using Woodland Scenics Black pigment. Woodland Scenics Green Undercoat was painted into recessed areas to depict damp/moss. 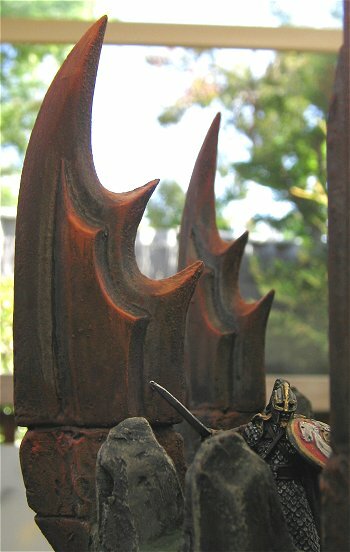 The rust was created using GW Dark Flesh, Bestial Brown, Blazing Orange and Golden yellow. I then washed the rusty metal areas with Woodland Scenics Burnt Umber. I glued the chain in place and washed it with Woodland Scenics Burnt Umber. Woodland Scenics Raw Umber was dabbed onto the base and lower parts of the tower to represent dirt. The plants growing up the side of the tower were made from a mix of Woodland Scenics Coarse Turf-Light Green, WS Fine Turf-Yellow Grass, WS Fine Turf-Weeds and a small amount of Light Green static grass. It was glued in place using PVA glue and a puffer bottle. The whole thing has several coats of Wattyl matt Estapol and Testors Dulcote. When I make the rest of the Fortress, I’ll try and take some photos of the various stages of construction.